It might not be a Nimbus 2000 or a Firebolt, but this traditional cobweb broom will be a lot more useful! These narrow round brooms built on a wood handle were used to stab cobwebs out of corners and work in your miniature scenes as the larger versions work in a house. The tiny brooms are fun to make as they use traditional methods with a simple twist on materials. 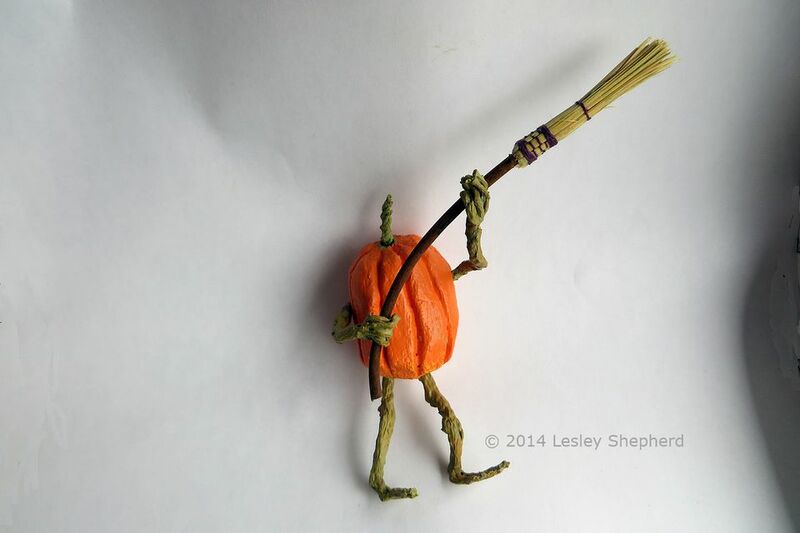 The brooms work for Halloween scenes like the miniature pumpkin with his vine arms and legs. They would be great alongside a miniature witch as well, or you can use them in traditional dollhouses. The simple instructions for this project begin with the materials in the next step. To make the miniature broom, you need a twig or some grapevine for the handle; traditional cobweb brooms have handles around 42 inches (106 cm) long. For broom straw, you will need a few pieces of straw from a broom, or some dried grass or reed stems. If you have access to it, coconut fiber also works well, and you may find pieces of thin weeds which will resemble birch stems to tie traditional 'besom' brooms for witches. You will also need a bit of thread in your choice of colors, a needle, and a miniature drill or pin vice. The 'trick' for making miniature brooms using traditional methods is to split grass or rush stems, or straw, to make a realistic looking miniature version for your tiny brooms. Cut pieces of straw or grass stems to length (in full size, they would be up to 21 inches (53 cm) long. You will need an uneven number of straws, enough to wrap around your twig broom handle, plus one or two extra. Holding a piece of straw firmly against a cutting surface, use the pointed end of a fine needle to split the straw. Insert the needle roughly 1/4 inch (6mm) from the end of the straw and pull it down towards the long end of the straw, keeping the short end as a single piece which has not been split. Try to make three or four main splits in your straw, then divide each of these into two or three more sections. If you split each straw into 12ths, it will be reduced to 1:12 scale broom straw. Don't worry if the pieces are not the same width, or if some of them split before you reach the bottom. To prepare a twig or stick handle for a miniature broom, take a piece of twig or vine which would be roughly the equivalent of 2 inches in diameter in your particular modeling scale. Something up to 3/16 inch (5 mm) in diameter and roughly 3 1/2 inches (9 cm) long, works well for a broom in 1:12 scale. For Halloween or witch's brooms, try to find bits of wood with character, lichens, or twists in the wood. Use a miniature drill or pin vice to drill a hole roughly 1/4 inch (6mm) down from one end of your handle. Make sure your needle and thread will fit through this hole, which is where you will anchor the straw to the handle. Once you have split your sections of straw (leaving 1/4 inch (6mm) at the top end solid, set the solid portions of the straw into a bath of water to soak and become slightly pliable. Thread your needle and pull your thread through the hole in your broom handle. Remove the thread from the needle and tie the thread tightly to itself so it is tight to the broom handle. Lay a section of your broom straw onto the handle so it covers the short end below the hole. You want the solid ends of your straw to line up roughly with the hole in the handle or the thread. Lay your sections of broom straw tightly side by side, covering your handle. Every two or three sections of straw, wrap your thread tightly around the handle and the straw sections to hold them in place. Continue laying in your straw sections until you have completely covered the handle with an uneven number of split broom straws. It is important that you have an uneven number so you can weave the ends of the straw. Wrap the thread tightly two or three times around the completed coating of straw, keeping the threads close together. Knot your thread to hold it tightly in place but do not cut it. With the broom straws firmly attached to the handle above the hole, take your thread under the end of one of your broom straws and begin to weave (or plait) the thread over and under the short ends of the solid (unsplit) broom straw along the handle. Weave over and under your straw, carefully moving the slightly damp (pliable) straw without kinking or breaking it. When you have reached a point where you can make another solid wrap of thread to match where you started tying on your broom straw, stop weaving, and wrap the thread around the straws and the handle to match the original wrap of thread. Tie the end of the thread off tightly once you have this wrap finished. If you wish, you can neaten the split ends of the straws by ​cutting them roughly even with a pair of scissors. Your miniature cobweb broom should now resemble the one in the top section of the photo on this page. To finish the broom, it is sewn below the end of the handle through the straw to hold the straw firmly together when the broom is being used. To sew the broom to stiffen it, run a threaded needle through the broom straw at a point below the end of the handle. Make a loop around roughly 1/5 of the straws at this point using your needle and thread and pull the thread loop tight, leaving the end of the thread in the center of the broom. Take your needle and put it back through the broom straw at the same angle you would use to draw a simple five pointed star. Pull the thread through the center of the straws and bring it back to meet up with the earlier loop of thread. Keep inserting the needle through the straw and bringing it back to the edge of the earlier stitch, a bit like backstitching on fabric. After five stitches, you should have a neat circle around your broom straw with all the stitches passing through the center of the broom. Tie off your thread tightly and tuck the end into the center of the broom. Experiment with making a range of these little brooms, using colored grass or straw, or different colored threads in a range of thicknesses. These traditional brooms work well for Christmas ornaments when combined with small dolls, as well as for Halloween decorations or decorations for kitchen wreaths.